Blueinfy's blog: Runtime Lambda Protection (Part 3) – "Self-Inspection"
Runtime Lambda Protection (Part 3) – "Self-Inspection"
Serverless functions, like AWS Lambda, are uniquely placed and transient in nature. 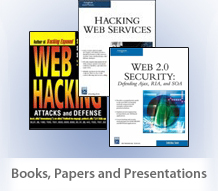 These functions need a non-standard approach for both pentesting as well as defense. In the past blogs, we have covered the following two aspects for protecting lambda functions using the 'protectLambda' utility of the 'lambdaScanner' toolkit (can be downloaded from here). In this blog, we will be describing an enhancement of the 'protectLambda' utility through which we can validate the code of the lambda function just before its execution and allow/deny the execution of the function on the results of this validation. We can define a regular expression to check for loopholes in the code of the lambda function – every time the code would be checked against this regex and the execution of the function would be denied if a security violation is detected in the code. Below is a basic diagram of how the module of the 'protectLambda' utility will be placed in the overall architecture of the application; right before the execution of the function. One can define a set of rules, via regex, which will get validated before execution of the function at runtime. Hence, it will be like performing SAST at runtime. This rule will not allow the developer to use API/code, which can be used to run underlying command execution. We are covering most of the combinations of calls via above regular expression. Let’s assume we have a function where developer is using the following line of code. In this way, the 'protectLambda' utility protects the execution of the function if the code is vulnerable using the rules defined through "code_protect.txt". Similar protection for the incoming event stream and outgoing responses through "in_protect.txt" and "out_protect.txt" respectively was discussed in an earlier blog post. 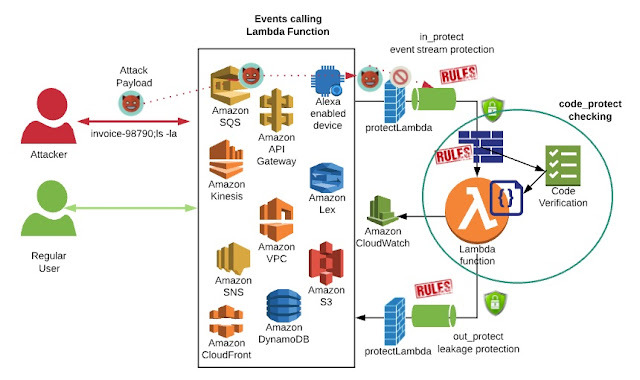 The nature of lambda functions and the method through which the functions are triggered make the traditional defense solutions inappropriate for serverless functions. So, as the first line of defense, the 'protectLambda' utility can guard against the code of the function, incoming stream of events as well as outgoing responses through a pre-defined set of rules. This defense technique along with a proper logging and monitoring mechanism would be a comprehensive approach for the protection of lambda functions at run-time.